When the TiPX hit the paintball community it set a new standard for durability and dependability in a compact, light weight pistol platform. The TiPX has an ultra low profile design and boasts an efficient "spool" valve core that fires .68 caliber paintballs with incredible consistency. 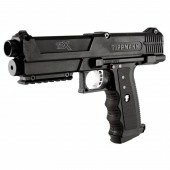 Tippmann TiPX Magfed Paintball Pistols There are 4 products. 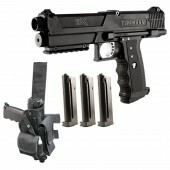 The TiPX uses a cost effective, low tension, straight stack 7 ball magazine to feed the TiPX while an under barrel 12 gram CO2 cylinder will provide the pressure needed to fire a paintball. 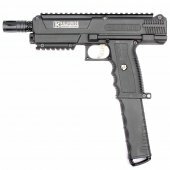 With a comfortable ergonomic grip frame and easy to maintain design the TiPX is perfect for any player looking for a dependable, easy to use paintball pistol.